Samsung spent comparatively little time talking about the Galaxy S 4 hardware and instead chose to focus mostly on software. 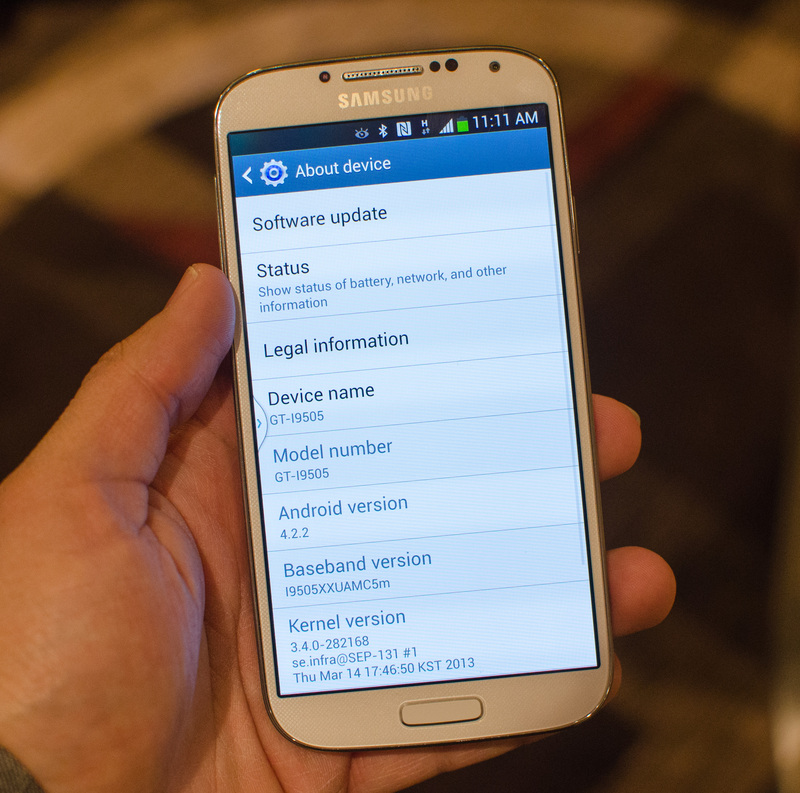 While Android 4.2.2 is the underlying OS, Samsung’s customizations are very visible and present throughout the Galaxy S 4 experience. The user interface and experience is distinctly Samsung. The Touchwiz icon stylings and water sounds that permeate the experience remain intact and mostly unchanged. UI performance is finally at the point on most of these modern devices where it’s just amazingly smooth throughout everything. The Galaxy S 4 is no exception here. Samsung spent a lot of time adding functionality to its camera app, which now includes the ability to shoot stills and video out of both cameras simultaneously. This is similar in nature to an LG feature we covered last month at MWC, Samsung calls it Dual Camera. Dual Camera is very easy to activate (there’s a dedicated button in the top left of the camera app). Once activated you can choose from various filters/effects, including a basic split screen mode. As a way of enhancing stills, Samsung includes support for Sound & Shot - a feature that captures up to 9 seconds of audio alongside a still image. There’s a new mode dial that allows you to switch between shooting modes, including some new ones like drama shot which lets you take multiple stills in a burst mode and combine them all together to show character progression in a still frame. Burst shooting can also be used to erase a photo bomb with eraser mode, a feature we’ve seen before (highlight and remove a character from a scene). 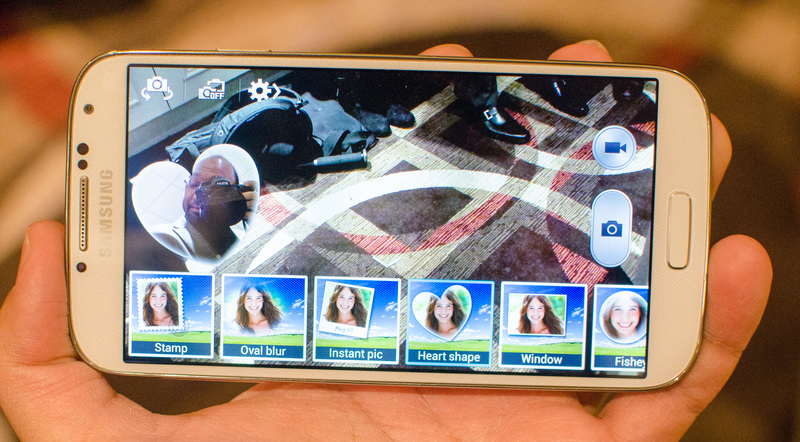 On the video side, the Galaxy S 4 introduces Cinema Photo - a feature that lets you shoot a video, highlight areas that you want to continue in motion and have the rest remain static - resulting in an animated gif. In its final new camera feature is the ability to create, group and stylize albums of your photos. 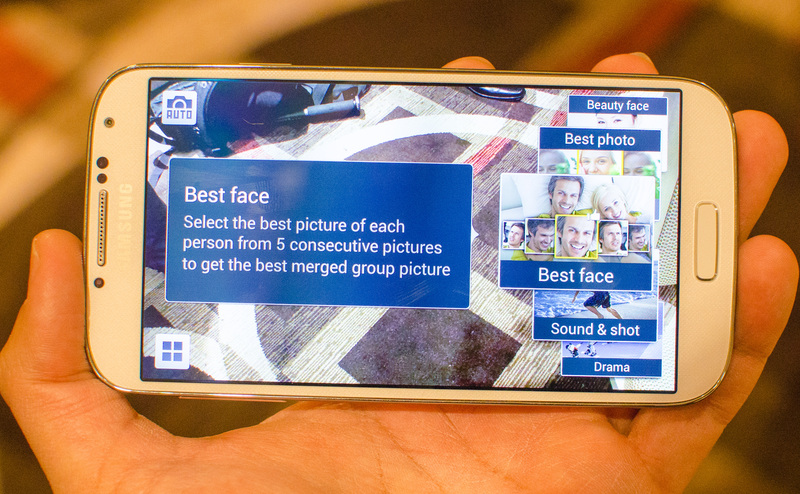 You can create albums locally on the Galaxy S 4, style them with templates, and send them off to print via Blurb. There’s Trip Advisor integration to pull in highlight information about the locations you’ve taken photos at. The camera software features are aimed at bringing as much of the photo processing/organization experience onto the smartphone as possible. Samsung clearly has the point and shoot market in its crosshairs and it is leveraging the fact that modern smartphones are sophisticated computing platforms in order to go after that market.